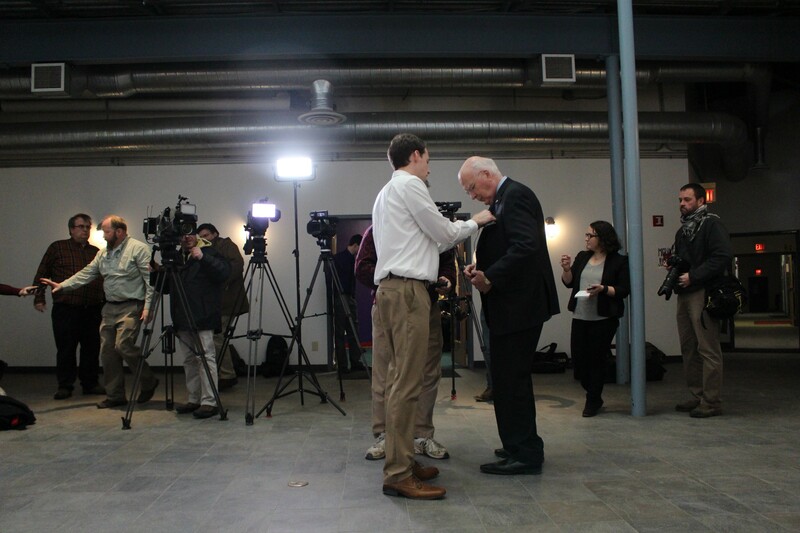 Sen. Patrick Leahy prepares for a Burlington press conference in February. A rising star in the Democratic Party plans to help Sen. Patrick Leahy (D-Vt.) raise money for his reelection campaign next month at a pair of Vermont fundraisers. Sen. Cory Booker (D-N.J.), the former mayor of Newark and a potential vice presidential pick, is scheduled to headline a reception May 2 at the Burlington home of Sarah Muyskens and Michael Green. According to Leahy aide Carolyn Dwyer, the senators plan to “promote their work on criminal justice reform” while collecting cash for Leahy’s eighth Senate campaign. Hosts of the reception include many members of Chittenden County’s political elite, according to an invitation obtained by Seven Days: Burlington Mayor Miro Weinberger, Chittenden County State’s Attorney T.J. Donovan, Rep. Mary Sullivan (D-Burlington), City Councilor Karen Paul, former gubernatorial chief of staff Liz Miller and former Vermont Democratic Party chair Jake Perkinson among them. The suggested donation is $100 to $250 per guest. The Leahy campaign has been hitting up the state’s lobbying corps, too. Three registered Vermont lobbyists told Seven Days they received invitations from Dwyer to attend. Hosts of the reception also include contract lobbyist David Mickenberg and University of Vermont Health Network vice president Theresa Alberghini DiPalma, a former Leahy aide and registered lobbyist. Some were also invited to a more exclusive, $1,000-per-person dinner to follow the reception. Leahy reported having $2.7 million in his campaign account at the end of 2015. In the five years since he was last reelected, he has raised $2.9 million, $956,000 of which came from political action committees. He currently faces no opposition, though 2014 Republican gubernatorial candidate Scott Milne has expressed interest in the race.